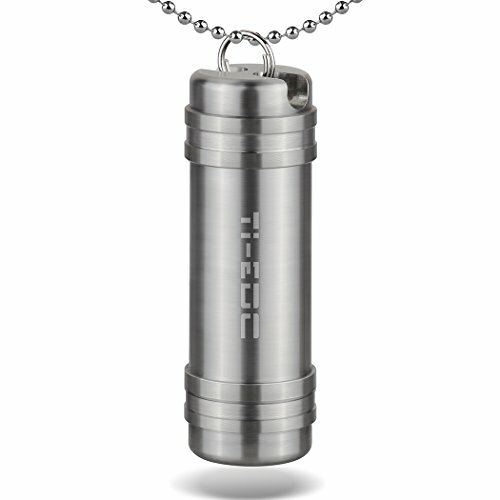 This TI-EDC large pill fob is good for larger pills and vitamins and can hold a bottle of Nitro. It can also be used for storing emergency cash, matches or even an AA Battery. TI-EDC pill fobs are beautifully crafted from lightweight, high strength and biocompatible (non-toxic and non-allergenic) Titanium. Super heavy duty to ensure your pills will not be crushed or broken but still compact enough to be portable. It has a screw-on cap with a rubber O-ring seal to keep pills airtight and moisture-free.